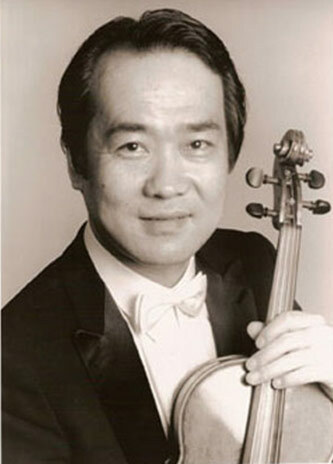 Masao Kawasaki, violinist, has given international concert tours as a soloist, recitalist, and chamber musician, and has given guest master classes. He made his solo debut at Carnegie Hall in 1985 and has performed in many festivals, including Spoleto, Rockport, Casals, Mostly Mozart, Nagano/Aspen, Aspen, Miyazaki International Chamber Music Festivals, and Viola Space. Kawasaki has made television appearances on PBS’s Great Performances series, Classic Hours, and NHK-Television. His recordings are available on the CBS, Sony, EMI, Nonesuch, Phillips, Bis, New World, and Pantheon labels. Kawasaki is a member of the Theater Chamber Players of the Kennedy Center, the New Jersey Chamber Music Society, the Bargemusic series, the Linton Music series, and the Aspen Music Festival Artist-Faculty series. He has served as an adjudicator for international competitions including Yehudi Menuhin and Lionel Tertis Competitions. He received the Presidential Scholars Program Teacher Recognition Award in 2004 and the Glover Outstanding Teacher of the Year Award in 1990. Kawasaki has held the Geraldine B. Gee Chair at Cincinnati College-Conservatory of Music since 1983. He has been head of the string department at Brooklyn College Conservatory of Music since 1980. He has been a faculty member at Aspen Music Festival and School since 1978 and worked at Philadelphia College of Performing Arts from 1980-83. Kawasaki received his diploma from Juilliard, where he studied violin with Dorothy DeLay. He has been a faculty member of the College and Pre-College Divisions since 1980.